Hello my friends .... now the adventures begin... yesterday in Bodo the new guests embarked Hanse Explorer which became my home already. I feel very comfortable here and the interior is awesome. 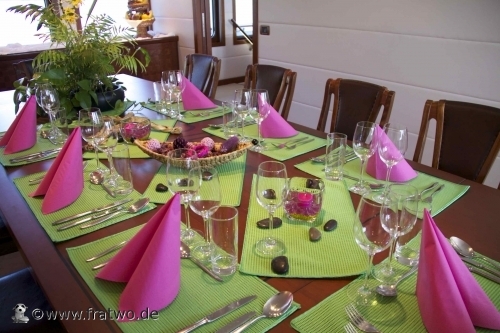 Have a look at the beautiful decorated lunch table, wow, I am really lucky to be on board. Our plans are to go to the Lofoten Islands tomorrow and I am very curious to discover new parts of the world. 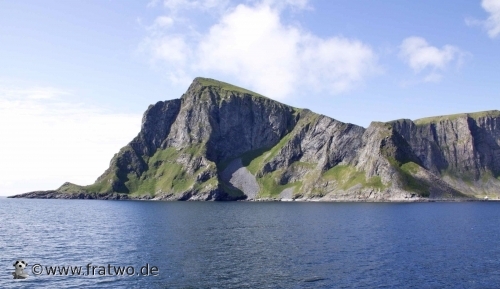 It is 0730 am and we dropped anchor in a small bay called Maastadbugten in Vaeroy Island... oh it is unbelievable here - the high mountains and steep cliffs covered with grass, everywhere puffins and white tailed eagles flying around and fish jumping out of the water, ohhh, I do not know where to look. While we were doing a scenic zodiac cruise among the cliffs we found a wonderful isolated sandy beach. Of course I couldn't wait to go ashore, it feels like being in the Caribbean, turquoise coloured water, white sandy beach, steep cliffs... awesome. After wondering around on the island we heaved up anchor and proceeded to another very mystic place: the Trollfjord. We will be there very late in the evening but Captain Maggi said I cannot miss that ..... well well look yourself at the pictures, I really cannot describe better how it looked like. 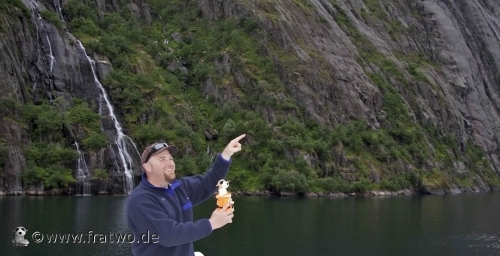 The Trollfjord is very narrow, only 100 m wide and about 2 km long and Captain Maggi manoeuvred the Hanse Explorer perfectly in the middle of the fjord. It seemed to me that I could just touch the steep cliffs where waterfalls rushing down.